The best workout songs and playlists for your running pace | Workout songs and playlists – jog.fm. I find 180 bpm to be quite helpful in keeping my strides quick. This looks like an excellent resource for getting more songs to run with. Today I ran 4 miles! It went pretty well — no need for walking, and the last mile actually felt pretty good! I am trying to diversify my running work-outs now. Tuesdays are my 3 mile runs where I just try to run a good steady pace — I guess as fast as I can really. Thursdays will be my interval days where I alternate sprints with either walking or jogging. And Sundays are my distance days — where I will add .5-1 mile each week. The emphasis isn’t on time, but distance. I did my first interval run on Thursday last week, and I’m not sure if I really pushed myself enough. I alternated 30 seconds of sprinting with 2 minutes of walking, repeated 6 times. That only came out to about 15 minutes, and I don’t think I even really got sweaty… but those last couple of sprints really killed me. I couldn’t even last the entire 30 seconds giving it 100%… so it wasn’t easy. I guess next time I might try jogging between sprints instead of walking…but jogging is hard enough as it is! I’m planning to run my first 5k next month and I’m hoping that incorporating sprints/intervals and increasing my distance will improve my 5k time so that I can finish under 30 minutes. The 5k is a St. Patrick’s Day one, so I’ve been spending a lot of time thinking about my costume/outfit. Probably more time than I should…hehe. I’m Irish, it’s my first 5k, so I feel like I gotta look cute and put the ROCK in shamrock, you know? 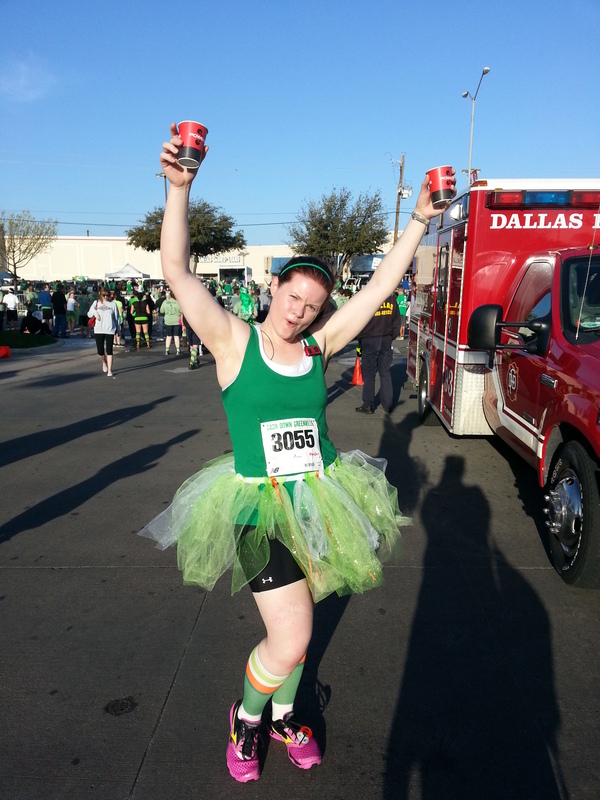 I am seriously thinking about making one of those tutus I see so many runners wear for 5ks. If not, then I need something else that’s cool… like a cape. I can’t believe it’s already a week into December! Pretty soon it will be 2013 (unless the Mayans were right after all…). I guess the holiday season is in full swing, but so far it hasn’t been too bad as far as temptations go. I’ve been sticking to eating mostly healthy/paleo, and am just continuing on my way with things. I figured it was past-due time for a check-in on the Couch-to-5k program. Tonight I did the second work out of week 5. It involved a 5 minute walk (warm-up), 8 minutes of running, 5 minutes walking, and 8 minutes of running again. I know I’m not running miles yet…but I feel so encouraged when I complete my runs. I almost feel like a runner… which is something I never thought I’d become. The third workout for week 5 is a straight 20 minute run. I’m scared of this one… it seems like such a jump from doing 2 8 minute runs with 5 min of walking between. But I’m determined to do this. Running is really cool. As a swimmer, I have always envied runners for a few reasons. 1. You get to listen to music while you run. When you swim, you hear just water-noise. Music is such a nice thing to have when you’re working out. Tangent: did you know that supposedly, the best bpm for running is 180? I learned this while I was looking online for good running music. 2. You get to breathe fresh air. Swimming – you breathe pool air (chlorine fumes). 3. You get to run around nice scenery, or see things. I’m fortunate to have a fairly nice running trail just 5 minutes walk from my front door. I get to see trees, ducks, geese, grass, a creek, and a monstrous display of Christmas lights! In swimming, I stare at a line at the bottom of the pool. 4. Convenience — running just takes putting on your clothes, shoes, and walking out the door. No need to travel to the gym. Yes, running definitely has its perks. I just look forward to when I’m at my goal weight (50 lbs lighter than what I am now); I’d imagine running will be so much easier and more enjoyable then.